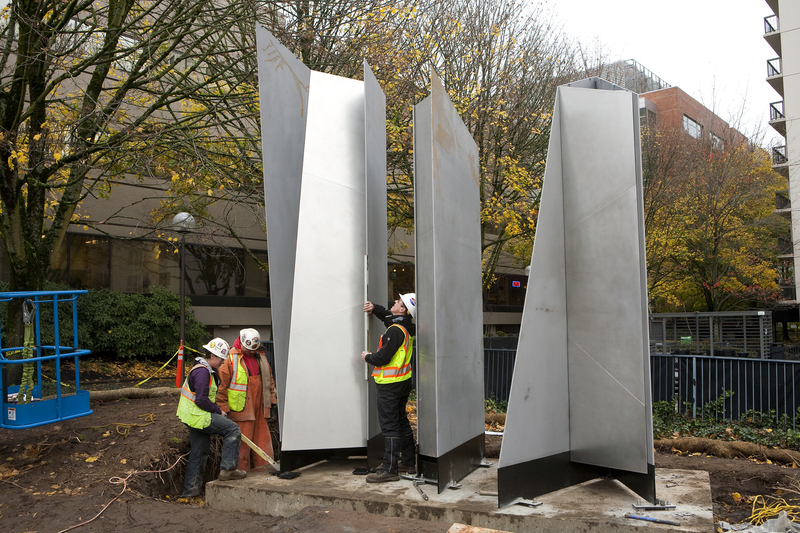 Two major public art sculptures were installed this week at two of the future Portland-Milwaukie Light Rail Transit Project (PMLR) stations. 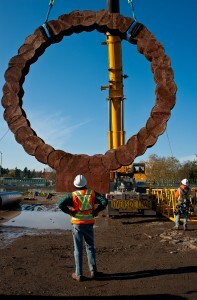 The sculptures were installed at the SE Tacoma/Johnson Creek and the Lincoln St/SW 3rd Ave MAX stations. North Carolina artist Thomas Sayre’s earth cast concrete sculptures were fabricated on site of the future SE MAX station. In August 2013 molds for the sculptures were dug directly into the ground, rebar reinforcement was lowered into place and then custom-colored concrete was poured into the mold. The concrete cured for two months before the first of two sculptures were excavated this week. The second sculpture will be unearthed and installed next year. 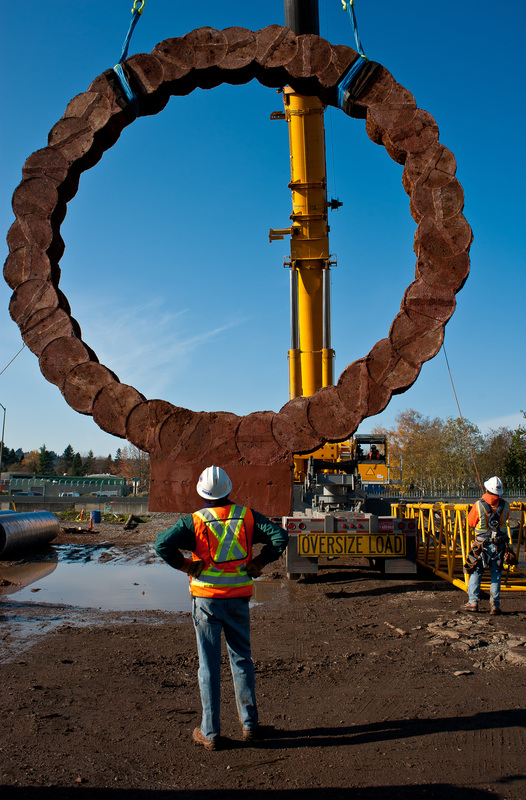 The round sculpture is 28-foot in diameter, and it’s the first time this type of fabrication has been used on a TriMet light rail art project. Sayre and team were assisted by PMLR’s East Segment General Contractor Stacy and Witbeck. The sculptures are a response to the industrialization and subsequent restoration of Johnson Creek and represent the influence of many different wheels upon the site, from a 19th-century sawmill on Johnson Creek to the wheels of the future light rail. A time-lapse video shows the fabrication and installation of one of the sculptures, which occurred over a period of eight hours. See the time-lapse video. Seattle-area artist Elizabeth Conner and crew installed three abstract, mixed metal sculptures, entitled Trio. The steel sculptures were inspired by the theatrical and participatory work of choreographer Anna Halprin and Lawrence Halprin, the architect of the adjacent Halprin District. The sculptures range in height from 9 to 12 feet and 2 to 5 feet in width. TriMet requires that public art be included in light rail construction projects. TriMet’s policy allocates 1.5 percent of the project’s civil construction budget towards public art. Approximately $3 million of the overall PMLR budget of $1.49 billion is dedicated to public art. • The first of its kind multi-modal bridge that will carry light rail, buses, bikes, pedestrians and a future Portland Streetcar extension, but no private vehicles.